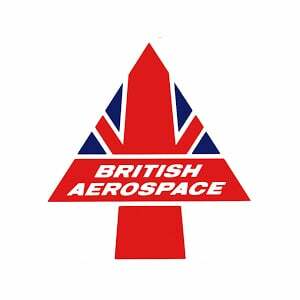 Belfor was contracted to supply flood and fire remedial works to the site and, once complete, they recommended that BAE should consider flood mitigation measures to ensure it didn’t ever happen again. Having watched a security video of the flood, Aquobex was able to make its recommendations for this remote area of the site. Due to the topology of the area, the river would overtop and flow directly towards the low-lying hangar and its multi-million pound storage facility. 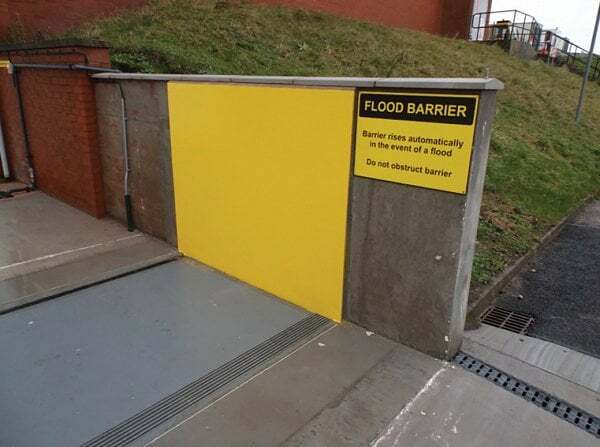 A FloodBreak barrier was recommended for the hangar opening as it has a fully automatic deployment mode, requiring no human intervention; even when it is retracting on the receding flood waters. T Clarke was contracted by BAE to install the required wing walls, the barrier and its connection to the local drainage. 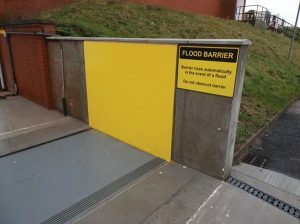 After the successful installation of the first barrier of its type in the UK, a full-scale flood test was carried out on the barrier using a sand bank wall and water from an on-site fire tender. The barrier successfully rose on the flood waters with minimal leakage on the dry side; which was equipped with sump pumps in order to protect against concurrent rainfall. Maintenance, which simply requires a visual inspection of the seals and cleaning of the drainage grills, was handed over to EMCOR at the final stages of the project. A satisfied customer, Ray Rogan, commented how well the barrier performed and how successful the project had been in such short timescales.